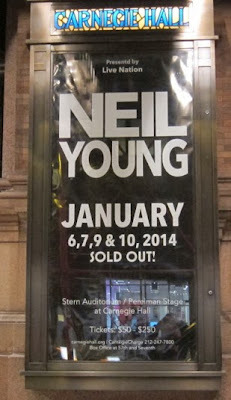 Neil Young's four-show run at Carnegie Hall in New York City continues tonight, Tuesday, January 7, 2014. Also, see the right, middle sidebar for continuous real time RSS feed updates. What? The right, middle, side bar? Pass that stuff over here - - - right ... middle ... huh ?? or is this Neil saying goodbye to Archives 1 and now its time for Vol 2??? And whilst i am at it, the CH shows later in the year can't just be the same as last year, that would not be them! Bring on the new stuff! What's up w the identical set lists ? My guess is that 'what's up' is Neil wanted to play that setlist again. I'm disappointed in Neil doing the same songs both nights. In this respect, he should be a little more like Pearl Jam (mixing it up every night). Or, you know, he's pushing 70. Neil has had plenty of tours where he alternated songs, maybe he's just at an age where he can't/doesn't want to do that anymore. Or maybe he picked THESE specific songs for a specific reason and wants everyone on each separate night to get the same experience out of them. Jeez, Neil puts out an awesome setlist and some people still complain. I would go see him play this show for 40 nights! Too many freakin jerks around here who just try to get a rise out of people. Sheesh. Also, most people don't attend 2.. 3.. or 4 shows. They attend 1. @Nate - yes, look over towards the right, about half way down. Actually the Rust@Yahoo RSS feed seems to be broken on the Yahoo end. The twitter feed is over that way as well. Good luck! @Rob - Identical setlists has been a pretty standard approach for Neil all along. If you look at the selections, the lyrics and themes tie together. There are ryhtms and ebbs and flows. Also, think about all the instruments onstage -- like 14+ or so. You don't see roadies scurrying around switching stuff. Neil's doing his thing. We just go for the ride. Lastly, we get to see how some folks at concerts always have something to complain about -- shouted requests, standing, texting, etc. Because of Neil's extended stay in the city, I was just wondering if he is traveling to shows in his bus? A picture of it in front of or next to Carnegie Hall, as some of his past solo tours at ornate theatres, would be special also. Last night's show now playing on Rust Radio! I agree. setlists are always very similar with only a few changes, if any at all. this is static behavior from him. must have been a lovely show. the only thing I can think to add from my favorites would be Now a Days Clancy which is a sort of companion to "Flying"
Neil's not obligated to switch up set lists so the 2 or 4 people in the crowd that bought multiple tickets can see him play different stuff. Most of us are fortunate enough to get to see him once, if you are going to get upset over hearing him play the same songs don't buy tickets to back-to-back nights of same tour. Tony, thanks for the heads up! Totally moved last night ... so grateful to Neil, to being on this lifetime journey with him and fellow fans, grateful to Thrasher for TW ... lots of thoughts and feelings ... first, just blown away from seeing just Neil there alone with his instruments in a small, beautiful venue with him combing through his trunk of memories and playing gem after gem ... as irony would have it, as I was very anti-covers, literally had tears streaming down my cheeks during needle of death ... it was so haunting, so beautiful, it was somehow for me one of the highlights as was 'Changes' ... 'Someday' was another highlight where Neil pulled out a somewhat obscure song from his past a brought it to life with deep, haunting emotion ... again totally amazed by how Neil breaths life into songs and even after listening to them literally dozens if not hundreds of times he brings it to life live .. thats how I experienced "Someday' ... a few observations ... lots of the show was played on the pianos and organs ... made me wonder if these shows are inspired from his reconnecting with the 'Cellar Door' era ... stripped down Neil, taking things to their total essence ... hard to remember the last time Neil played only oldies ... no song played thats not 20 if not 40+ years old ... lots of mentions of Stills and CSNY all conveying love and appreciation ... for some reason never thought he'd play 'Southern Man' ever again ... 'Goin Back' mindblowingly sublime ... wow ... it was worth being a Neil Young fan just for that one song ... overall to reflect on the ferocity of last year's PP Crazy Horse tour and then last night's gorgeous simplicity with just Neil, his instruments, and his soulfulness ... just feel fortunate to be plugged into whole scene ... it truly feels like these past 5-10 years have been awe inspiring .. what can you say, so grateful!!! What an amazing night it was! Lots of "hollywood types," as Neil said, in the crowd. Donald Trump, Charlie Rose, Jim Jarmusch, Elvis Costello to name a few, including Pegi sitting right across the aisle from us a few rows back. Perfect show/setlist for the venue. I'm going to try and scrounge up a couple nosebleed seats for Friday night if I can find any. Can't wait to listen to this one again. I've got to learn how to play that acoustic arrangement of Southern Man. Truly breathtaking. Concert sounds outstanding. He has aged well with his music. Thanks for all memories and the trunk loads that are still to come. Please release this on video ASAP! Is there a production crew there filming it? I am sure he has his regular crew there filming it for his archives. who knew Trump could have such good taste to attend. that possum in rigor mortis for a toupee is usually on Fox News. Just look at the Horse Tour, Chrome tour, and so on. He puts together a show and plays the show. Personally, I'm a deep trax kinda guy.. so the second set was a let down from that point of view. The first set last night was a brilliant cross section of the Neil experience... and then acoustics of CH are incredible. Again, the second set was a bit of a classic rock radio experience, for greatest hits fans... not for the fan who listens to unreleased 70's material (Chrome Dreams style). But Neil GAVE last night in a heavy way... regardless of the songs he played. -Only Love Can Break Your Heart. -Flying On The Ground Is Wrong..
Really enjoyed watching some of the show on youtube....great, much better than 'Cellar Door' in my opinion. He's really performing those songs very well. Mellow My Mind was quite a brave choice for someone with a diminishing vocal range, and he pulled it off! And personally, I actually like it when Neil repeats the same setlist, as long as it's not for too many nights in a row (for example, the Psychedellic Pill setlist last year had started to burn out before they even arrived here in Europe, in my opinion). For a long tour, some changes are necessary to maintain the same heights of inspiration. But for a relatively short tour, I do think repeating a setlist can really build the intensity over a few nights (Europe 1989 being the classic example). Had a great time with family on Monday. Just checked StubHub for the "hell of it", and found a single, so looks like I'll be able to go again this week!! So happy for all you folks getting to see such amazing shows. let the petty minded do and write as they will. Gee there are some stupid journos about. That article on Neil asking the audience to stop clapping during Ohio. Quite apart from the clapping being out of sync and annoying..
how appropriate do you think it is to joyfully clap along to a song about uni students being shot dead on campus. As mentioned many times before..
Get someone who knows something to do the review next time!! These observations by so many well-spoken fans are spot on for the mind-blowing, trip that happened on Monday night when I saw him. My wife surprised me on Christmas day with tickets for opening night. 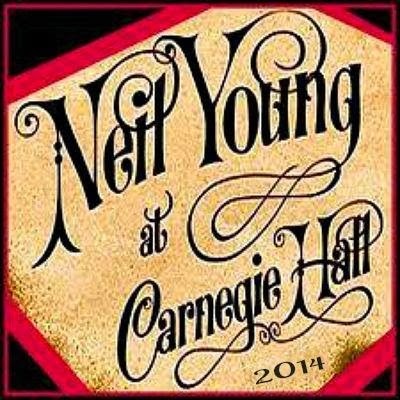 Cincinnati to NYC, three nights in the beautiful city capped by Neil solo at Carnegie Hall. Are you kidding me? Neil was absolutely on fire. The run into Needle and the Damage done from Needle of Death was haunting. Mr Soul on pump organ and harmonica cranked!! Carnegie Hall and her walls were shivering. Neil was completely locked in. It was a living room performance - at times he walked aimlessly throughout his instruments while changing harmonicas. The sound of the harmonicas locking in position as he places them into the harp rack. It was like thunder. For the most part you could really hear a pin drop. Neil's instruments are so dialed in sonically it is something to behold. This was a show by a master of dynamics. Very low-lows and screaming highs. A full space-ship synthesizer over top a grand piano on A Man Needs a Maid. At this point I was becoming one with Carnegie Hall and everything happening within it. Ohio into Southern Man sounded like it was always written as a suite. I could just keep writing about this night but just read the other comments and you'll get the picture. Any kind of seat for Thursday or Friday shows would be worth it just on sound quality alone. I'm so thankful to have this experience. You guys from Europe who attended and bought the tickets from the Carnegie hall website. I'm just curious, did you get your tickets well in advance before you got on the plane or how did it work out? @doubter ... I gotta believe Trump really is a fan. When I was at Greendale in Atlantic City (Taj Mahal) Trump and his wife walked right up front with the rest of us and stood shoulder to shoulder for a song or 2. Neil even referenced him during the story telling, something about being nervous that the boss was in the room. About the scalpers, I've heard lots of bad stories... BE CAREFUL! If its too good to be true, it usually is. I saw one guy selling an extra that was also going to the show. Pretty good scenario if you can find it. Good luck to everyone out there, It really is a magical night! I listened to a recording today. Some songs are really good like Needle of Death, Ohio, Flying on the Ground and Southern Man. Nice, intimate vibe going on. Surprising to hear A Man Needs a Maid and Love in Mind, but he can't sing them like he used to. I though they were kind of dissapointing compared to earlier versions with that terrific high voice. I also didn't like Mr Soul on pump organ that much. I rarely like Neil's playing on the pump organ. Inspired performance Tuesday night - a perfect interplay of gorgeous melody, lyrics and voice that elevated every song to a fresh and emotionally intense experience. Been a fan since age 13 (40+ years) and Neil continues to amaze with a delivery that convinces me that every story just happended to him today, and that he is telling it for the first time. I don't know if that makes him an artist or an entertainer, but it's a rare gift indeed (even Dylan doesn't have it) to so enrapture and mesmorize an audience for 2 1/2 hours. (Found this concert to delvier more power and go straight to the heart in a way Neil and the CH boys couldn't do last year despite all the electronic manipulations.) Also interesting that at the end of the show, when Neil was no longer holding onto a guitar or a lyric, just taking in the warmth of a crowd of his peers (many very accomplished in their own right and New Yorkers no less! ), that he looked a little overwhelmed and moved by the audience repsonse. I think that's the real Neil; bet it was the highlight of his night. Just want to see a live set of Greendale before I die...I won't retire but I might re-tread! Play a record of your want to hear the "hits". When is the last time he played "Love and War" live? "Neil even referenced him during the story telling, something about being nervous that the boss was in the room." Proving that Neil is not the sharpist pencil in the box when it comes to politics. I don't like to mix politics and art, but "Mr. Trump".....spare me. Proving Neil and his fans need some serious consciousness raising.